Simplicity returns to the Service Department of Car Dealers; Two-Way Text Messaging and Intelligent Call Routing gives another edge to Early Adopters. With AutoReady, our service advisers don't have to give out or use their personal mobile phone, which helps separate the personal from business communication. Envoc (pronounced "Invoke") has introduced a web-based software service called AutoReady. 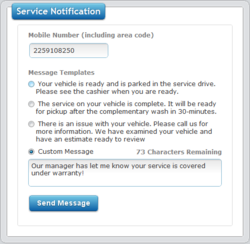 The service allows car dealers to leverage two-way text messaging and voice call routing to notify customers of the status of their service appointments improving follow-up scores and CSI (Customer Satisfaction Index). A recent study conducted by the Pew Research Center’s Internet & American Life Project shows that 73% of adults prefer text messages to phone calls. Automotive service departments are finding that AutoReady improves communication with their customers, saves time, maintains privacy, and strengthens their customer relationships and loyalty. "After a customer drops their car off, our service advisers can shoot them a text message in seconds letting them know we’ve completed our analysis, completed their estimate, or that their car is getting a complementary wash," says Parts and Service Director, Sterling Edmonston at Acura of Baton Rouge. "Reducing the time to notify customers helps us turn loaner cars faster and improves follow-up scores, as well." AutoReady is entirely web-based and may eliminate the need for company provided cell phones. Each dealership is assigned a unique local phone number which is used for both text messaging and call transfers. You interact with a single web page - provide a mobile number and select from a list of common pre-configured messages, or type your own custom message, then press "Send." Customers can even reply to text messages and service advisers can see messages being sent and received in real time! With the "intelligent callback" feature, if a customer calls the number that sent the text, they will be intelligently transferred to the extension of the service adviser who sent the message. This helps to separate personal and business communication. One year ago, Envoc, a software company based in Baton Rouge, Louisiana, came under the wing of the Southeast Louisiana Business Center and is fast becoming a success story for the center's business incubator. For more information contact Calvin Fabre at (225) 910-8239 ext 101 or visit http://envoc.com.